The second Los Angeles High School, located on Fort Moore Hill, appearing in Three On A Match. USC Digital Library. This post comes with a shout-out to Christina Rice, Senior Librarian overseeing the invaluable Los Angeles Public Library Photo Collection, and author of Ann Dvorak: Hollywood’s Forgotten Rebel, the wonderful biography about the spirited actress who played many standout roles during the early 30s at Warner Bros. Although Ann does not grace any of the locations revealed here with her presence, her sympathetic portrayal of doomed characters in Three On A Match and ‘G’ Men provides the dramatic focus for both films. For more information about Ann visit Christina’s site http://www.anndvorak.com/. The playground scenes opening Three On A Match were filmed behind the second Los Angeles High School. The original wooden Los Angeles High School (standing in the left image directly above the arrow) was completed in 1873, and survived until it was demolished to make way for the Hollywood freeway. 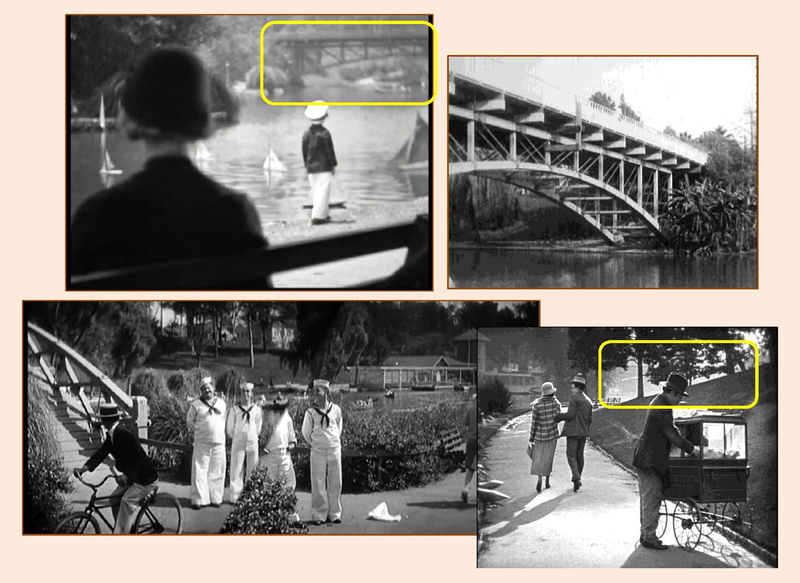 Three On A Match – Lyle Talbot abducts Ann’s son beside the famous arched bridge at Hollenbeck Park. Ann’s character in Three On A Match abandons her son and husband for a wild life of booze and drugs with a petty gambler. 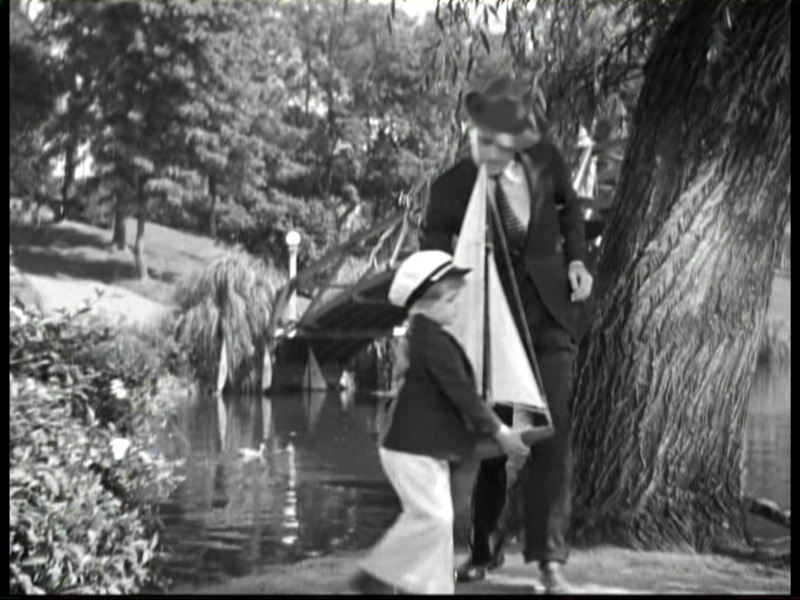 Ann’s friend, played by Bette Davis, take Ann’s son to the park, where Ann’s boyfriend kidnaps the child hoping to raise emergency cash to pay off his gambling debts. The harrowing scene was filmed at Hollenbeck Park, where many classic comedy films were staged, including Harold Lloyd’s Haunted Spooks and Girl Shy, Snub Pollard’s It’s A Gift, and the Laurel and Hardy favorite Men O’ War. Years later, the park hosted an elaborate song and dance number for the 1957 Doris Day musical The Pajama Game. Bette Davis watches over Ann’s son as the former 6th Street Bridge spanning Hollenbeck Park appears at back. Below, a panoramic view of the park, looking south towards the bridge, from Laurel & Hardy’s Men O’ War and Harold Lloyd’s Girl Shy. Views of the former 6th Street Bridge from Three On A Match and The Pajama Game (Doris Day at far right). 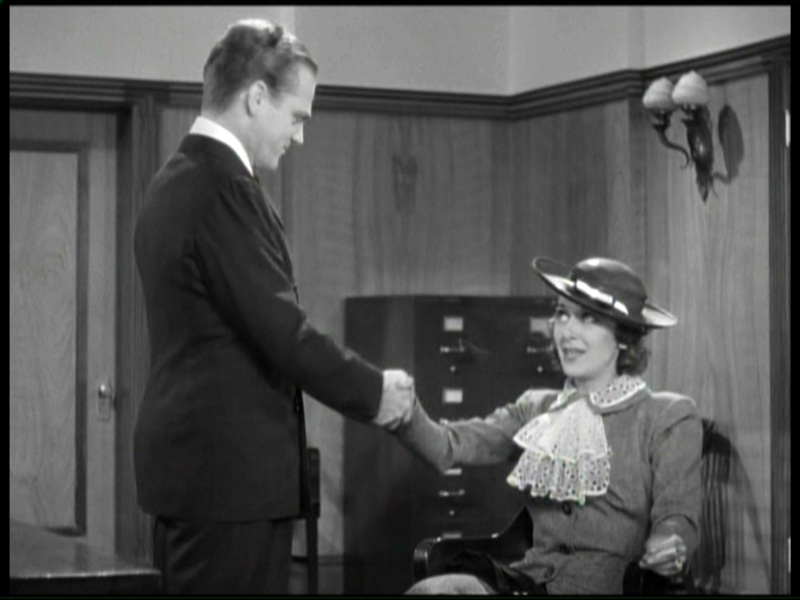 Ann holds her own with James Cagney in ‘G’ Men. 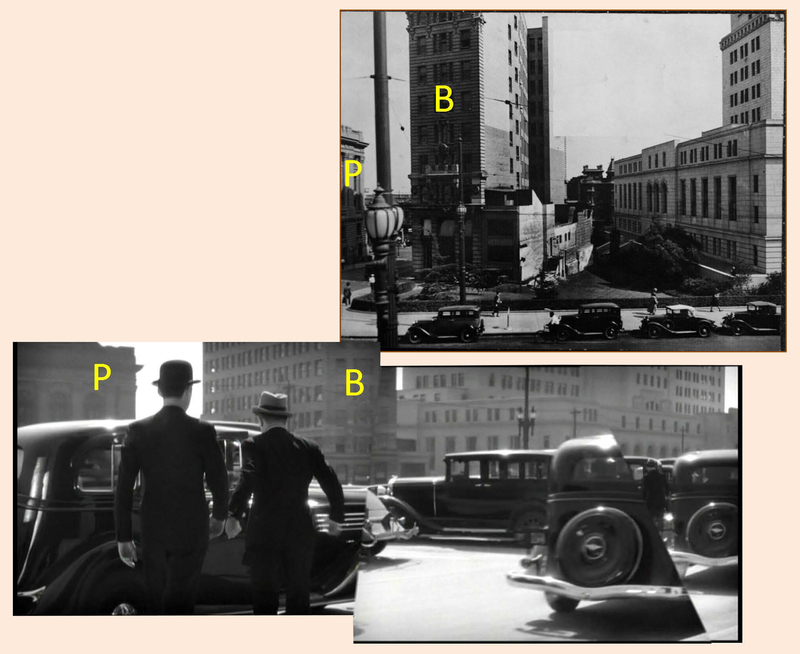 I’ve already covered many film connections between Ann’s next film ‘G’ Men and Buster Keaton’s One Week (see post describing the machine gun car chases staged in Inglewood HERE). But ‘G’ Men contains several other classic locations as well. ‘G’ Men night scene staged at the former Southern Pacific depot at 5th and Central. USC Digital Library. ‘G’ Men – Edward Pawley is led in handcuffs from the Southern Pacific depot lobby – interior view at right. USC Digital Library. This view below shows Edward Pawley’s train arriving at the back of the Southern Pacific Depot. 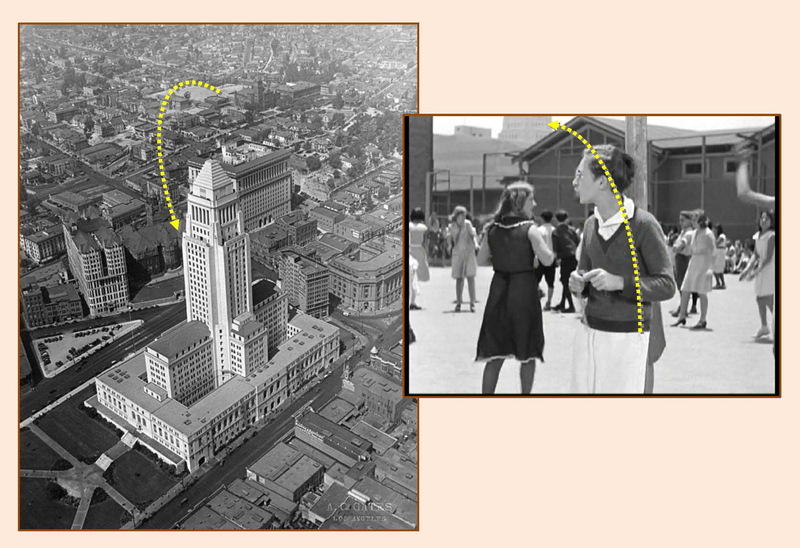 The many awnings depicted here obstruct the view – so some films, such as Harold Lloyd’s Girl Shy, would show trains arriving behind the Santa Fe depot, and yet show the passengers leaving from the front of the Southern Pacific depot a few blocks away! Views from behind the Southern Pacific depot – at night during ‘G’ Men, in daylight from Our Modern Maidens (1929). USC Digital Library. 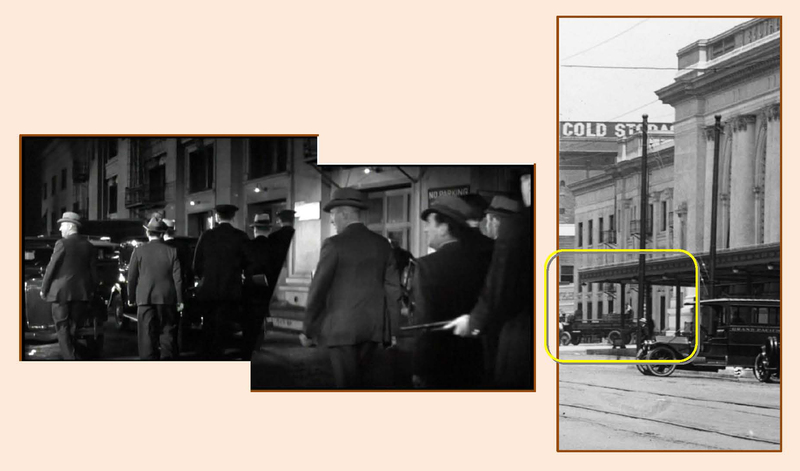 The ‘G’ Men gunfight was staged on Central Avenue north of the depot lobby. USC Digital Library. 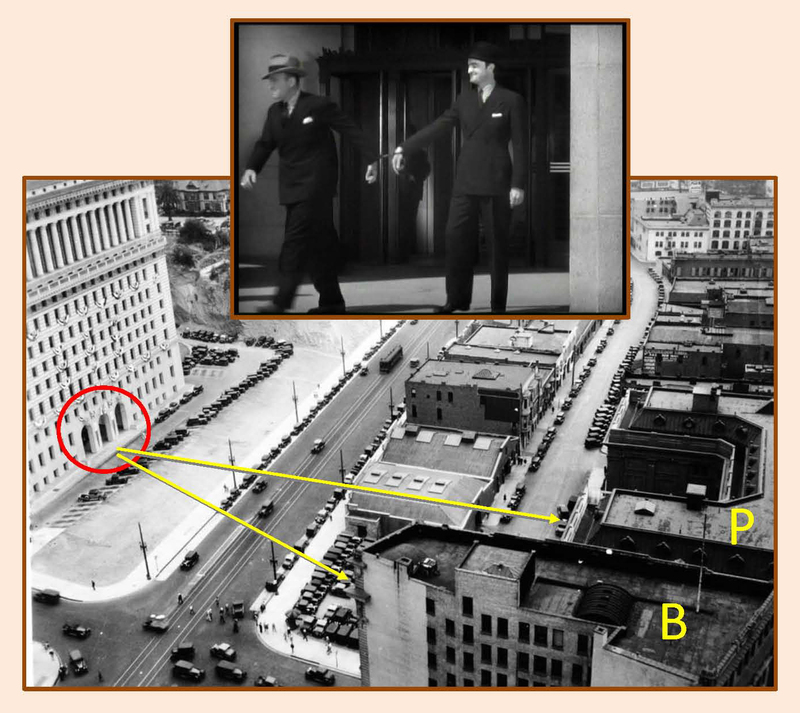 Later in ‘G’ Men, Edward Pawley is led out from the south entrance to the Hall of Justice, providing a remarkable vintage view of the one-time downtown cityscape. To the left stands the former Federal Building and Post Office (P) at Temple and Main, while the right reveals the side of the former International Bank Building (B). The view from the Hall of Justice appearing in ‘G’ Men. Marc Wanamaker – Bison Archives. 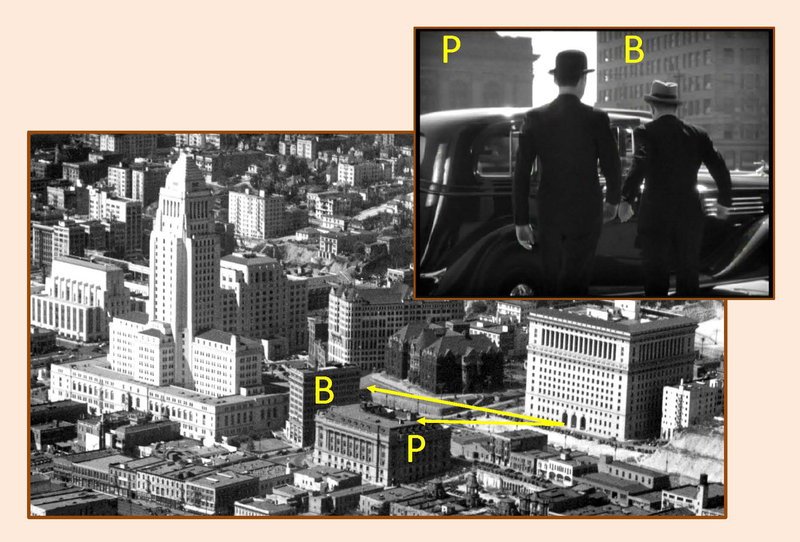 Below, another view showing where Edward Pawley is led from the Hall of Justice during ‘G’ Men. Looking east toward the Hall of Justice south entrance, and the former Federal Building and Post Office (P) and bank (B). USC Digital Library. Matching views looking south from the Hall of Justice towards the Federal Building and Post Office (P), the International Bank Building (B), and to the right, City Hall. USC Digital Library. Closer comparison views of the International Bank Building (B) looking west from Temple as it appeared during Bill Strother’s real-life climb staged for Safety Last!, and a view looking up Temple from Main Street at the former Federal Building and Post Office (P). USC Digital Library. Three On A Match and ‘G’ Men copyright Warner Bros. The restored and recently re-opened Hall of Justice. This entry was posted in Los Angeles Historic Core, Pre-Code and tagged "G" Men, Ann Dvorak, Fort Moore Hill, Hall of Justice, Hollenbeck Park, International Bank Building, Los Angeles High School, Safety Last!, Southern Pacific Depot, Three On A Match. Bookmark the permalink.